1. Remove drive belt. Refer to EM-155, "Removal and Installation". 2. 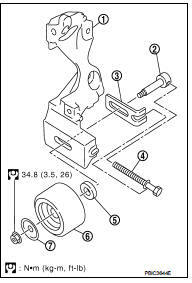 Remove the lock nut, and then remove the plate (7), idler pulley (6), and washer (5). 3. Remove the center shaft (2) together with the spacer (3) with inserting the adjusting bolt (4). 1. Insert the center shaft (1) into the slide groove of the spacer (2). Fully screw in the adjusting bolt (3) in the belt loosening direction ( ). 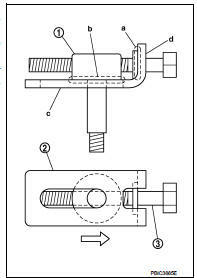 • At that time, place the flange (a) of the adjusting bolt and the seat (b) of the center shaft on the spacer. 2. Place each surface (c and d) of the spacer on the alternator bracket. Install the washer, idler pulley, and plate, and then temporarily tighten the lock nut. 3. Install removed parts in the reverse order of removal.